This weekend reminded me how wonderful a simple overnight adventure can be. Me, Jake, and Phoenix @ Sand Island. Jake and I set aside three days this weekend for a sail on the Columbia River. The plan was to sail west. We would dock at Sand Island (near St. Helens) the first night, continue downriver to Sandy Island to anchor for the second night, and then head back home. We set out Friday afternoon. After passing under the I-5 and railroad bridges, we hoisted the mainsail and staysail, unrolled the genoa, and turned off the engine. We were entirely under sail power for the next few hours. We had a great time sailing. We took turns every few tacks; Jake would man the helm while I would "woman" the jib, and then we'd swap roles. We practiced navigating--comparing the charts to buoys and day markers along the river. We were making between five and six knots, the sun was shining, and all was well. Me, free at the bow. 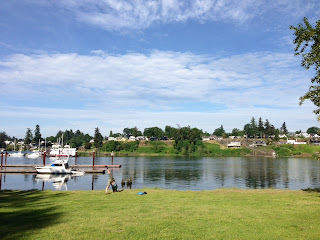 It was exciting to be on a new part of the river, and we were quite pleased with the sailing we had done thus far. As we approached St. Helens, the winds picked up, as expected. It was an interesting set of conditions--the current was moving us in one direction, but the wind was blowing in the opposite direction. We went to turn on the engine so that we could motor into the dock at Sand Island. Alas, the engine did not start! Jake has never had a whole lot of confidence in the battery and charger system aboard Phoenix. After our engine failed to start during an evening sail the prior week, Jake spent Wednesday and Thursday nights last week replacing the charger and batteries on the boat. We were hoping that a fresh system would help with the failed engine starts. This, we learned, was not the case. Apparently the starter is in need of some TLC, too. We decided to douse the main and stay sails, and to carefully maneuver our way over to the dock on the island. Fortunately, we were able to steer. We used the opposing forces of the current and wind in our favor, and Jake furled and unfurled the jib in small increments to get us safely to the dock. It was a smooth landing! The view of the river and the docks from Sand Island. Once at the dock, we made sure the boat lines were securely fastened. And then we rechecked them. And then we rechecked them again. When we were sure that all was well, we went for a walk on the island, circumnavigating the entire island in about half an hour. We returned to the boat, made dinner, and then settled in for the night. I fell asleep quickly--snuggled in the v-berth, being rocked to-and-fro by the large waves and lulled by the sounds of the fenders getting squeezed against the wooden dock. I was too sleepy to care if the winds were to set us loose and run us aground. Jake, on the other hand, stayed up for awhile, worried that one of the lines would snap. After another check on the lines, he finally fell asleep, too. We woke up the next morning to quiet--the winds had died down considerably. Occasionally we would hear a piece of driftwood bounce off the bow. We took some orange juice and muffins over to the island and enjoyed breakfast on the land. We watched an eagle perched upon a nearby tree--after a few minutes, he took off over the river and then came back to the perch with a perfectly magnificent approach and landing. (i.e. one-legged downward-facing dog), down by the river. Will and his friend (two folks we met at the island), makin' music on the docks. Fortunately, we were able to get the engine started on Saturday morning, and so we motored back to the marina in Portland, glad to get the boat (and our home) back to its slip for safe keeping until we can ensure that the engine will behave reliably. Phoenix back at home. Me in the bowsprit. From the mast's eyes. Sure, the adventure ended a day earlier than planned. And, sure, we still have some work to do on the starter to build our confidence in motoring. But that didn't dampen our spirits. 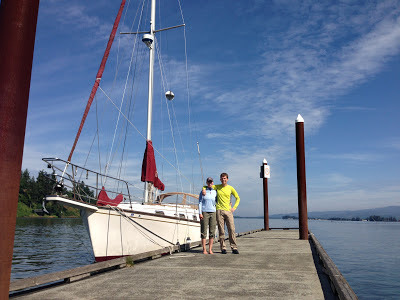 We still had a great sail--we explored new territory, we gained more experience in sailing, we had an awesome dock landing without the motor, and we enjoyed each other's company. Most importantly, this weekend's adventure was a great reminder that sailing is all about being flexible!